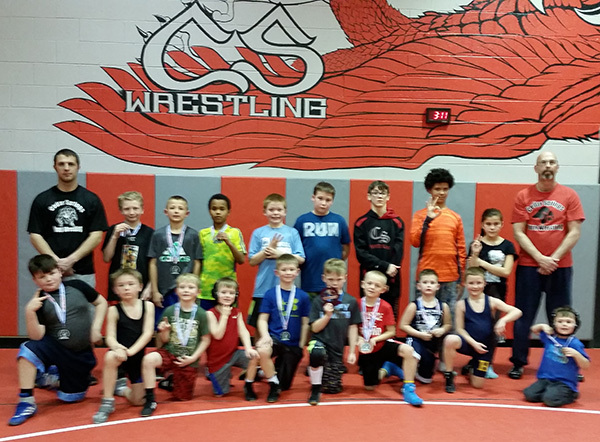 Thirty-one Cedar Springs Youth Wrestlers travelled to Greenville last weekend along with 379 other competitors to battle it out for a custom Monster Medal. They came in 2nd place in match points with 339 (Greenville had 349) and 4th in over all number of pins in the shortest amount of time with 20 in 24:28. Wyatt Dickinson put his moves to the test and finished the day with 40 match points! Chaysn Winchel had 2 pins in a combined time of :24, and Tucker Crystal had 3 in 1:10. “Our kids showed up in force on Sunday and really put their skills to the test—some of them wrestling in their first competitions. And the parent volunteers have been an amazing help every week. We wouldn’t have this level of excellence without them!” said Coach Scott Marsman. In the 2010-2012 All division, 40lb class, Micah LaFlure placed 4th after 3 matches. In the 43lb-B class Dawson Pike placed 3rd after 4 matches, scoring 19 match points. In the 52lb-B class, Tucker Crystal placed 2nd after 4 matches, and Jayden Mull placed 3rd after 4 matches, scoring 29 match points. In the 55lb class, Chasyn Winchel placed 3rd after 4 matches, and Ben Streeter placed 4th after 3 matches. In the 2008-2009 Novice division, 58lb class Johnny Fanhauser placed 3rd after 5 matches, scoring 26 match points. In the 58lb-B class, Deegan Pike placed 1st after 3 matches, scoring 26 match points. In the Open division, combined 72/77lb bracket Jonathan Libera placed 2nd in his weight class, 3rd over all after 3 matches. He scored 15 match points. In the 2006-2007 Novice division, 90lb class Thomas Prins placed 3rd after 4 matches, scoring 16 match points. In the 130lb class David DeWeese placed 3rd after 3 matches. In the Open 80lb class, Hudson Crystal placed 2nd after 3 matches, scoring 7 match points. In the 2004-2005 Novice division, combined 70/75lb class Ricco Artecki placed 2nd in his weight class, 3rd over all. In the 80lb class Marisol Ramos placed 2nd in her first competition, had her first pin in 2:27 and scored 12 match points for the day. In the combined 85/90lb Mason Vernon placed 2nd in his weight class, 4th over all after 3 matches. In the 95lb class Cole Haack placed 2nd after 3 matches, scoring 7 match points. In the 133lb class Daqwuan Jones placed 3rd in his first competition. In the 2002-2003 All division, 95lb class Andrew VanGessel placed 2nd. In the combined 170/195lb class Landen Totten placed 1st over all, scoring 9 match points.